Karl W. Giberson (Ph.D.) is an internationally known scholar whose work has been translated into several languages. He is a popular speaker and writer, and directs the Science & Religion writing workshop at Gordon College. 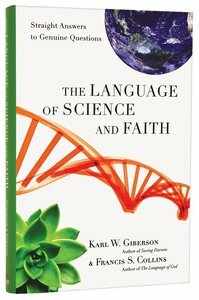 Giberson has published over two hundred articles, reviews and essays and written nine books, includingSaving Darwin and, with Francis Collins, The Language of Science and Faith. He lives on the web at www.karlgiberson.com. Karl W. Giberson (Ph.D.) is an internationally known scholar whose work has been translated into several languages. He is a popular speaker and writer, and directs the Science & Religion writing workshop at Gordon College. Giberson has published over two hundred articles, reviews and essays and written nine books, including Saving Darwin and, with Francis Collins, The Language of Science and Faith. He lives on the web at www.karlgiberson.com. 1 Do I Have To Believe In Evolution? 2 Can We Really Know The Earth Is Billions Of Years Old? 3 How Do We Relate Science And Religion? 4 Can Scientific And Scriptural Truth Be Reconciled? 6 Why Is Darwin's Theory So Controversial? 7 What Is The "fine-tuning" Of The Universe And How Does It Serve As A "pointer To God"?